In this article Next Siooon will discuss about Disease Lipoma, Information includes Understanding - Symptoms - And How to Prevent Disease Lipoma. Disease Lipoma - Lipoma is a fat lump that grows between the skin and the muscle layer. Lipoma usually makes the affected skin area soft and easy to move when getting pressure from the finger. Lipomas are generally detected at adulthood and some people can have more than one lipoma. Patients will feel uncomfortable because they feel there is something strange on their skin like a lump appears, although it does not hurt but its presence is very disturbing. Even sufferers more often touch a lump on the skin. Lipoma is a harmless and non-cancerous disease. Special treatment is not needed as long as lipoma does not interfere with your daily activities. Lipomas are often found in the neck, back, shoulders, arms and thighs. In addition, this lump can also develop in other body parts such as the intestine. Even so, the cause of lipoma is not known with certainty. It's just that middle-aged men and women and those who have family tend to experience this disease more. Influenced by genetics, Gardner's syndrome, a condition that causes the formation of benign tumors. Adiposis dolorosa, a condition characterized by the appearance of soft fat-filled lumps. Familial multiple lipomatosis, a hereditary factor that causes the formation of several lumps containing a layer of fat. Madelung's disease, a rare condition characterized by a lump containing a layer of fat that forms in the upper body area. Cowden syndrome, a condition characterized by the appearance of benign tumors, excess skin, and size of the lump is quite large. Although lipoma can affect people of all ages, this condition is more common in those aged between 40-60 years. Lipoma is more common in people who are older. Basically lipoma can occur in all parts of the body. An easily recognizable symptom is the appearance of small and soft lumps with a width of less than 2 inches. Sometimes lipomas can also develop more than one. Generally, lipomas occur in the neck, shoulders, back, abdomen, arms and thighs. Lumps can be bigger, but generally the diameter is not more than 5 cm. When the lipoma grows bigger and contains a lot of blood vessels or suppresses the surrounding nerves, the lipoma will cause pain especially when pressed. The size of the lipoma will not change and its growth is very slow. Although rare, the lipoma can grow deeper and bigger. Immediately see a doctor to get an examination and treatment appropriately. The diagnosis of lipoma can be done by physical examination or tissue sampling (biopsy). In addition, to distinguish between a lipoma lump and a cyst lump, the doctor will recommend an ultrasound examination. Meanwhile a CT or MRI scan is needed if the lipoma has a large size and looks deeper than fat tissue. This is done so that the doctor gets a clear picture of whether there is a possibility of a malignant tumor. If the lipoma is painful, it grows rapidly and does not move under the skin, there is a possibility that it is a malignant tumor. Keep in mind that fat tissue cancer is fast developing and is not easy to shift from under the skin and cause pain. Immediately visit or consult a doctor to get first treatment. This was done to prevent Lipoma from growing bigger. 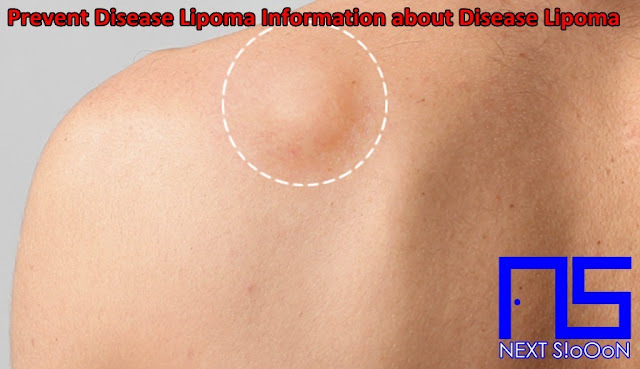 Lipoma is a disease that does not require special treatment. However, there are a number of home-handling steps that can be done, including: Frequently monitor for lumps that appear on your body. Although the lump is not dangerous, this condition can be more serious and must be treated immediately. Call your doctor when the lump shows a reddish color and appears swollen with warmth. Regular consultation with a doctor to monitor the development of symptoms. Listen to each doctor's advice and do not do it yourself in dealing with lumps. In addition to home handling, handling that can be done is through medical means such as liposuction, drug use, to certain operations. Liposuction is used to get rid of fat clots in the lipoma. If possible, the doctor will perform an operation to remove lipoma by cutting the skin on it and removing a benign tumor of fat tissue or lipoma. This method makes the lipoma not grow back after being removed, but only leaves side effects such as badges and bruises. However, keep in mind that existing benign fat tissue or lipoma cannot be completely removed. Thus it is still possible to develop again in the future. Another treatment that can be used is injecting steroids to shrink the lipoma. Steroid injections can be used in the area of ​​the lump. This treatment can reduce lipoma, but it cannot completely eliminate lipoma from the body. Another important thing you should know about lipoma is that this disease can cause pain when it grows bigger, suppress nerves and have many blood vessels. Lipomas that grow in the spinal cord and the brain pose a danger of complications such as speech problems until paralysis occurs. Doctors will also provide direction and information about recommended foods and foods that are prohibited. Lipoma Disease, Lipoma Disease Information, Lipoma Disease Article, Lipoma Disease Information, Lipoma Symptoms, Causes of Lipoma Disease, Factors Causing Lipoma Disease, Lipoma Disease Impacts, Lipoma Medication, Relief of Lipoma Symptoms, Overcoming Lipoma Symptoms, Lipoma Disease Symptoms, Lipoma Disease Management , Things to do with Lipoma, What is Lipoma, Definition of Lipoma, Information on Understanding Lipoma, Symptoms of Cause and How to Overcome Lipoma, Lipoma Detail Info, Tips to Relieve Lipoma, Tips to Overcome Lipoma Disease, Overview of Information About Lipoma, recognize the causes and symptoms of Lipoma, prevent Lipoma by knowing the symptoms and causes.